The values that inspire our employees every day are embedded in the corporate culture of each company in the Monnoyeur Group. For more than 100 years, the Monnoyeur Group has always been there for its customers. The group has successfully prepared for, adapted, invested, retained the human resources needed and taken risks to consolidate its know-how and to ensure customer satisfaction in France and elsewhere. Our 100 uninterrupted years in business and more than 80 years of partnership with Caterpillar are testimony to the professionalism of our teams. It is also testimony to our employees’ ongoing commitment to all our customers. 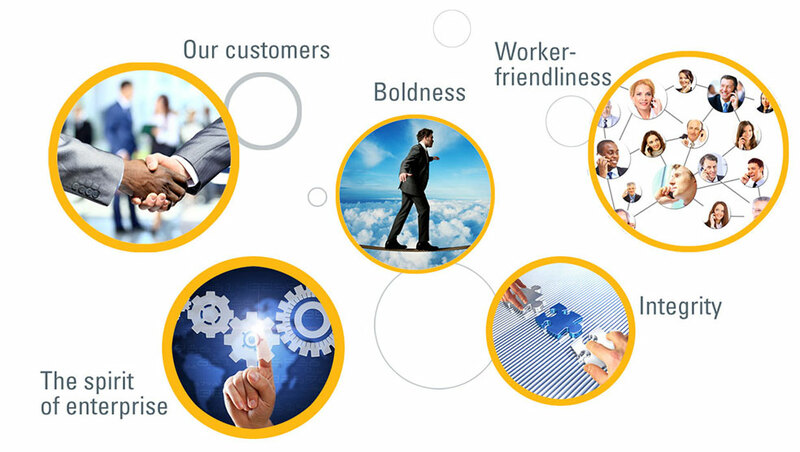 In order to plan and manage our future growth and to support our customers in all their activities, the courage to face challenges guides all of the group’s employees as they manage customer relationships and lead their teams. Throughout the economic and social crises of the 20th century, Group Monnoyeur has successfully preserved high-quality human relations both inside and outside the group. By deliberately keeping its organisation on a human scale, the Group is committed to straightforward business relationships, responsiveness and mutual trust. Our customers applaud us for it and our employees demonstrate their appreciation through their commitment and diligence. Vision and entrepreneurship are two qualities that have allowed the Monnoyeur Group to tailor its products and services, withstand a series of economic shocks and expand its range of activities and know-how as it accumulates business expertise. The group’s growth is underpinned by the spirit of enterprise and innovation, which is a source of creativity inside company and an effective growth driver for our market share and long-term revenue. Dependability and continued customer satisfaction rely on the integrity of our business relationships. Our working approach and culture provide the basis for trust and ensure the quality of our services. 2012: Drawing on its proven experience in wind farm projects, the Group stepped up its activities in renewable energy by creating a new subsidiary, Eneria-REN, which primarily engages in developing anaerobic digestion and gasification projects. 1997: Bergerat Monnoyeur acquired the short-term equipment leasing group, Slevmi, known today as Bergerat Monnoyeur Location, and continued to pursue its expansion. Bergerat Monnoyeur Manutention, today Aprolis, a distributor of Caterpillar lift trucks. Bergerat Monnoyeur International, today Magellan, which distributes global brands of capital goods in Algeria and in Roumania with IPSO. 1981: In 1981, Bergerat Monnoyeur became Caterpillar’s general dealer for Algeria. 1938: The company opened its first regional subsidiary in Toulouse. In France, Bergerat Monnoyeur steadily gained a reputation for selling high-quality Caterpillar equipment for public works. 1906: In France, visionary entrepreneur Henry Bergerat founded Hy. Bergerat & Cie with his cousin, Francis Monnoyeur. The firm imported machines supplied by the world’s leading industrial corporations. 1929: Francis Monnoyeur signed a contract making the Hy. Bergerat Monnoyeur & Cie the sole agent for the Caterpillar Tractor Company in France.